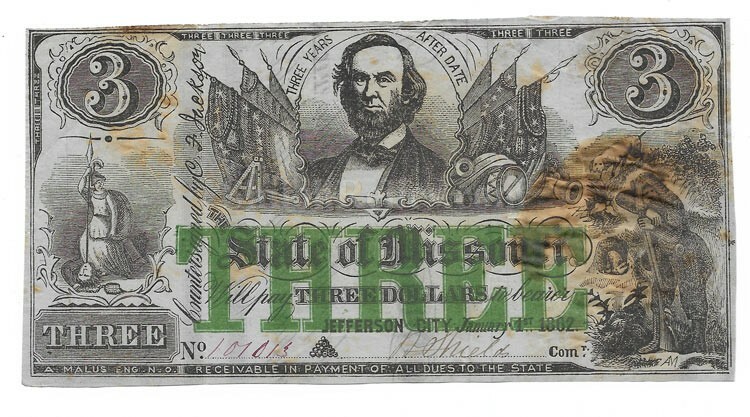 This is a scarce Civil War $3 from the State of Missouri. It is issued from Jefferson City, Missouri on January 1st 1862 and is so printed on the face of the note. 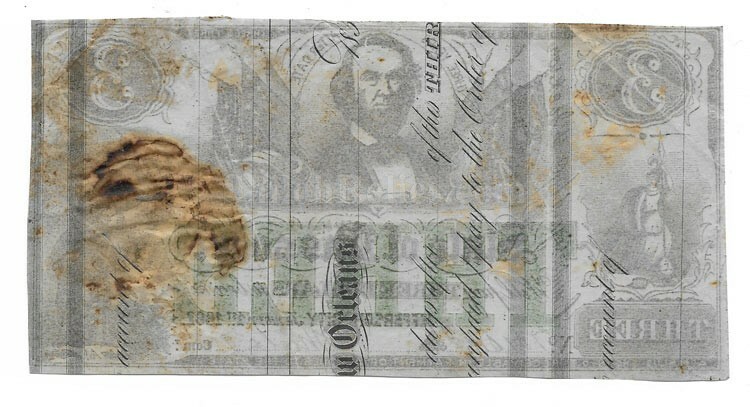 In the center of the note it has the image of Governor Claiborne Fox Jackson flanked by Confederate flags, cannons, and a sextant. In the center of the note it has the large green protector "THREE” printed onto the blue colored paper. This was added to help aid in counterfeiting of the note. One thing that is neat about this note is that it was printed on paper that had already been printed on once. During the Civil War any paper was in short supply so they made the most of what they had. At the bottom of the note it has a pyramid of cannonballs and a frontiersman with dog to right. The note is correctly hand signed and numbered in old ink. It has the overall size that measures 6 inches by 3 inches. This is a very desirable note that is in attractive circulated condition. It comes in an acid free holder for display and preservation.